Log cabin in Branson is one of the most chosen accommodations by visitors who want to save more from their vacation dollars. Beautifully located in a secluded area in Branson where tranquility can be felt around, the log cabins at the Grand Mountain provide guests comfort, convenience, and affordability. This cozy log cabin in Branson is waiting right here in a calm environment where guests will always have the chance to enjoy exciting activities and adventures in the area surrounded with spectacular wildlife, unspoiled scenery, and the picturesque rolling hills of the Ozark Mountains. These comfortable log cabin accommodations at the Grand Mountain have great features of high-end amenities such as free wifi connectivity, cable TV with HBO, and a DVD player. All of these log cabins have fully equipped kitchen that includes modern appliances such as fridge, microwave oven, dishwasher, washer/dryer, pots and pans, and kitchen wares and utensils. When you stay at the log cabin at the Grand Mountain, you can have the chance to experience good old hospitality in the Ozarks. The convenience and affordability that you can enjoy when staying in a log cabin in Branson are some of the reasons why many guests choose to stay in this cozy accommodation. The log cabin accommodation at the Grand Mountains offer a unique opportunity for every guest to stay in a rustic natural setting that offers a luxurious and comfortable way of living yet affordable and conveniently located near the heart of the legendary live entertainment district in Branson. These luxury log cabins in Branson feature the best package in town that include top quality amenities and a picturesque view of the beautiful natural scenery which can be enjoyed when you relax at the outside porch of your cabin. When you choose to stay in a cabin at the Grand Mountain, you’re assured to enjoy a great time as this accommodation features elegant amenities such as stone fireplaces, tiled countertops, wood flooring, excellent beddings and Jacuzzi tubs that are sure to pamper you. 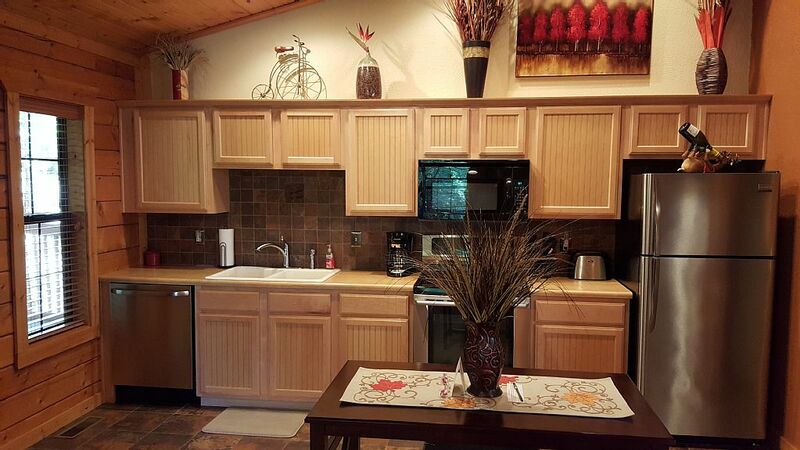 These cozy cabins have other features of great amenities including tile and marble bathrooms, walk-in-closets, and open porch where you can spend your morning coffee while looking at the beautiful sunrise over the Ozark Mountains. When you enjoy so much of a relaxing stay in your cozy cabin accommodation, it’s time for you to enjoy the next day seeing exciting attractions, live entertainment shows, shopping and dining opportunities which can easily be accessed from your door step. Featuring a variety of beautiful designs and floor plans, from modest to all out luxury, these log cabins at Grand Mountain are dream come true for those who want to save more on their long-planned vacation. Vacationers are not the only ones choosing these affordable accommodations, they’re also a favorite choice of businessmen looking to invest on the booming tourism market. If you’re looking for a place to spend a wonderful vacation this season, choose a log cabin in Branson as it provides you a luxurious and comfortable way of living.